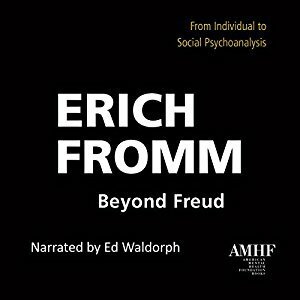 One of four works by Erich Fromm, issued by The American Mental Health Foundation, newly available as an audiobook. Available as an audiobook along with three other of Erich Fromm‘s works issued by American Mental Health Foundation Books (along with Coping with Anxiety in an Age of Terrorism, new, by Dr. Raymond B. Flannery Jr., and soon, There’s No Handle on My Door: Stories of Patients in Mental Hospitals, by Dr. Henry Kellerman): Beyond Freud: From Individual to Social Psychoanalysis. Uncovering the social unconscious of the individual as well as the unconscious of social entities…. To this end, this incisive audiobook consists of four sections: (1) Man’s Impulse Structure and Its Relation to Culture, (2) Psychic Needs and Society (a 1956 lecture), (3) Dealing with the Unconscious (a 1959 lecture), and (4) The relevance of Psychoanalysis for the future (a 1975 lecture). Click here to order the Audiobook.